As the saying goes, “like father, like son.” Father Bently and son Jag are the dynamic duo of Marmoset Gardens, where they share their digs with a variety of other colorful characters, like a red-crested turaco, Demoiselle crane, Mandarin duck, and others. They don’t wear capes, but they both love jumping on their keepers and riding around on their shoulders as their habitat is cleaned. Jag and Bently don’t own cell phones of their own, but that doesn’t mean they won’t enjoy hearing the ring-tones on yours. 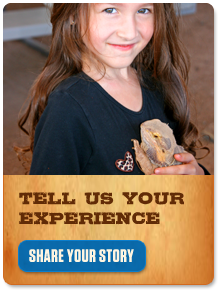 They find the tones irresistibly mesmerizing, just like you’ll find our Marmoset friends…irresistibly mesmerizing. 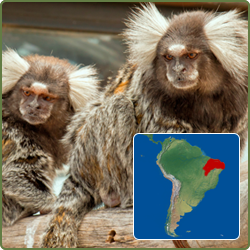 Common marmosets are native to Brazil. They live in the northeastern and central forests ranging from the Atlantic coast and inland into Rio Grande do Norte. They have been introduced into other areas and live within the cities of Rio de Janeiro and Buenos Aires, Argentina. Marmosets can be found in a number of forest habitats. They live in Atlantic coastal forests as well as semi-deciduous forests farther inland. They can also inhabit savanna forests and riverine forests. Marmosets excel in dry secondary forests and edge habitats; although they show great variety in the habitats in which they can live. Like tamarins, marmosets are among the smallest primates, with average head and body lengths between 7 and 7 ½ inches. They weigh between 8 and 9 ½ ounces with the males being slightly larger than the females. The coat, or pelage, of the marmoset is a blotchy brown, grey, and yellow. They also have white ear tufts and long banded tails. Unlike many other New World primates, marmosets do not have a prehensile tail. Their faces have pale skin with a white blaze on the forehead. At birth, infants have brown and yellow coats and develop the ear tufts as they age. In form, members of the callitrichid family, marmosets resemble other primates that cling vertically to trees. The forelimbs are shorter than the hind limbs, but most locomotion is quadrupedal, meaning all four limbs are specialized for walking and climbing. The hands and feet resemble those of squirrels. The thumb and big toe are not opposable. The surfaces of the hands and feet are long relative to the digits. Additionally, all of the digits except the big toe, called a hallux, have sharp claws, not the flattened nails found in many other primates. Callitrichids use these claws to dig into the bark of trees. Callitrichines also are unique in having enlarged, chisel-shaped incisors and specialized digestive systems for their diet. Common marmosets have a complex mating system. It was thought that they were monogamous; however, polygamy has also been observed. Nevertheless, most mating is monogamous. Even in groups with two breeding females, the subordinate female often mates with males from other groups. The gestation period lasts for 5 months, and females are ready to breed again around 10 days after giving birth. Their inter-birth intervals last 5 months, and they give birth twice a year, commonly to two non-identical twins. Because of this, females have high demands during pregnancy and lactation, and need help from the other members of the family. Infants are weaned at 3 months. At 15 months, they reach adult size and are sexually mature but can’t reproduce until social conditions are adequate. Common marmosets are active during the day and live in family groups. It is typical for female to have more than one mate. Females produce one to three young annually. Young are often carried on the parents’ backs. In species where twins are produced, the male often carries the young while the mother forages, transferring them back to their mother only long enough for the offspring to nurse. Like all primates, vocal and visual communication is important to common marmosets. Facial expressions and vocalizations convey information about social status, emotional state, and intent to other individuals. Visual signals are important in close-range communication while vocal communication is more important over longer distances. Some expressive facial and postural positions include the “partial open mouth stare,” “frown,” and “slit-stare,” which are used to signify alarm, aggression, and submission. When common marmosets flatten their ear-tufts close to their heads in “tuft-flatten” position, this signifies submission, fear, and sometimes curiosity of new objects. The common marmoset’s claw-like nails, incisor shape, and gut specialization reflect their unique diet which is primarily made of plant fluids (exudates) and insects. Common marmosets feed on gum, sap, latex, and resin. They use their nails to cling to the side of a tree and, with lower incisors as big as their canines, gnaw off the bark to stimulate the flow of edible fluids. Because marmosets are small, insects also prove an important food source. The small size of the marmoset allows them to subsist on insects. They are skilled in stalking and pouncing on large, mobile insects. Marmosets will also eat fruits, seeds, flowers, fungi, nectar, snails, lizards, tree frogs, bird eggs, nestlings, and infant mammals. Dominance is maintained through various behaviors, postures, and vocalizations. Subordinates will groom their superiors. Pygmy marmosets are the smallest of all monkeys, but the smallest primate is the mouse lemur. Infant marmosets have very strong cling reflexes and will not voluntarily leave their carrier’s back for the first 2 weeks. The common marmoset remains an abundant species and is not currently threatened in any part of its range. Nevertheless its habitat range has been degraded at a large rate, with at least 60% of the cerrado region of Brazil converted to human use in the 1990s and around 80% cleared for agriculture more recently.